The Porcupine Mountains are about a 12-hour drive from my area. 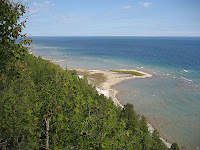 So in an effort to break up the drive, we camped for two nights at Straits State Park in St. Ignace, Mich. which is a short ferry ride away from one of the state's jewels, Mackinac Island. Of course, this also was the holiday weekend which meant the island was likely to be packed with tourists. To get away from the craziness, we opted to hike some of the island's many trails. I couldn't find much information about the trails prior to the trip. While we were hiking on the island, I joked with my BF that we should make enough trips to hike and catalog every single trail on the island so I could write a book (I'm a writer by profession) since no one else has seems to have taken on the task. All that we were able to find to guide us was a flimsy trail map inside the front cover of the Visitor Center's $1 guidebook. The map showed no trail distances and had no descriptions of what the trails were like. It was going to be an adventure because we weren't sure what we'd find! We opted to walk the Arch Rock Bike Trail, which connected to Tranquil Bluff Trail. The latter lives up to its name. Although one of the islands quaint roads runs pretty near to the trail in many sections, no automobiles are allowed on the island. Therefore, the most disturbance we experienced on the trail were other hikers or people bicycling on the road... and the small airplanes flying overhead (the trail happens to be in one of the flight paths of the island airport). Even those encounters were few. This trail was quite the getaway we had been hoping for. An easy hike in terms of elevation, the path was sprinkled with tree roots often but it also ran near the water, and every now and then the trees would open up for an awesome view! We picked one of these spectacular views as our place to lunch that day. On the menu was one of the new recipes I prepared from the Freezer Bag Cooking book I purchased. It made for an easy lunch: just pour in the water about 30 minutes prior to eating and the noodles soften for a delicious cool noodle salad. We let our meals soak for only 20 minutes, which left some of the veggies a little crunchy. I'd recommend letting the meal soak longer if you have the time (which is easy enough... just keep hiking!) but we really wanted to sit and eat and this one particular spot. 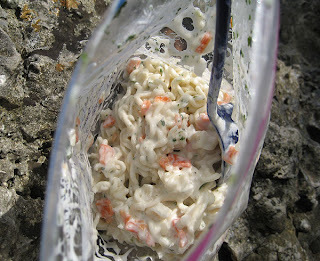 The freezer bag meals can be a little messy after you mix things up and then try to dig into the bag with your spork to fish things out. Thankfully, I'm known as the napkin queen and we had paper towels to wipe off our hands and flatware after eating. But my BF recommended grabbing some wet wipes for other meals we'd be eating later in the week, and that turned out to be a good suggestion. We rounded out our hike by making a loop and trekking down Soldier's Garden Trail, to North Blodgett Trail, to South Blodgett Trail, to Rifle Range Road, to Garrison Road and back down to Main St. I really wish I knew how long of a hike this actually was, cuz it was a good one! We were both tired! But, fulfilled. The main portion of the island, where all the shopping is, was a madhouse when we stepped out of the woods after 2 p.m. that afternoon. After being in such a peaceful environment, neither of us wanted to deal with the hoards of people that had descended on the island since our arrival early that morning. I told my BF I just wanted to make one stop to buy some of Mackinac Island's famous fudge and then we were chugging straight back to the ferry dock for the next boat outta there. It was too hot and we were too tired to fight with people in trying to oogle all the souvenir knickknacks the shops have to offer. I've been to the island many times and didn't need a souvenir anyway! Just my fudge, LOL. Add 1.5 c. of water to the freezer bag with the noodles, squeeze out the air and seal the bag. Let sit for 30 minutes to an hour. Drain the water from the bag. Add the dressing and mix everything up really good and voila! A nice yummy trail lunch! My omnivore BF liked this recipe very much!